AN emotional Liam Neeson has received an award from the President of Ireland for his contribution to the country and humanity. Receiving the honour, the Irish actor revealed that he was wary of giving public addresses. “My fear, and it’s a genuine fear, is public speaking. “Everyone says ‘oh, you’re an actor, you should be good at that.’ It’s just not true,” he said. 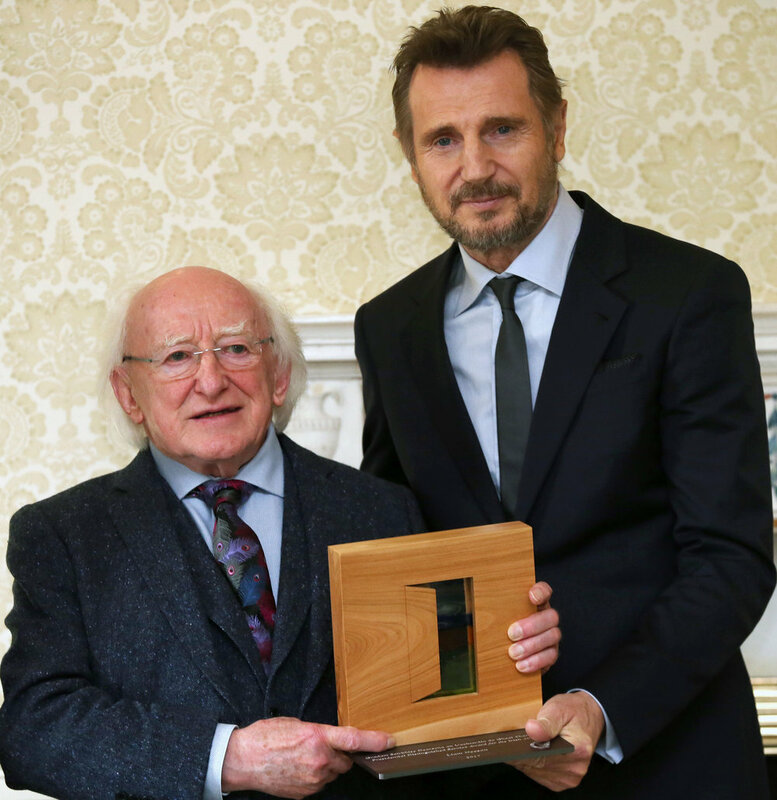 Neeson was presented with the Presidential Distinguished Service Award by President Michael D Higgins. The award highlights the outstanding work by Irish people living overseas across a range of areas, from sport to science, charity or community support. Neeson, who appeared slightly emotional as he received the award, said he was “honoured” and “very humbled”. He said he would continue to “fly the flag for Irish arts” and the charity Unicef, of which he is a goodwill ambassador. President Higgins described the Ballymena native as a “splendid Irish man abroad” and a “worthy recipient” of the award. “We started the awards in 2012 to give recognition to the contribution of Irish people living abroad who have made a distinguished contribution, not just to Ireland, but to humanity in general. And indeed, that is the case in the case of Liam Neeson”, he said. Mr Higgins added: “I think our reason for having the award is to be able to say the Irish family isn’t defined by national borders or territories. “It is defined by care, compassion, a shared culture and heritage, a common sense of responsibility, a consciousness of our historic experience and also the importance of Ireland contributing dynamically to a future that would be humane and more compassionate and just. Liam Neeson qualifies by all of this criteria”. Of the sixty awards presented to date, only two have been awarded to Irish Australians, the late Jim Stynes and author Tom Keneally. The citation for Neeson’s award reads: “As an extremely gifted and internationally renowned film actor, Liam Neeson has helped to raise Ireland’s profile and awareness of Ireland and Irish artists around the world, especially in the United States where he is based. LIAM Neeson says that the Hollywood sexual harassment scandal has sparked “a bit of a witch-hunt”. Asked about the issue on the Late Late Show, Neeson, 65, said: “There is a bit of a witch hunt happening too. “There’s some people, famous people, being suddenly accused of touching some girl’s knee or something and suddenly they’re being dropped from their programme....” He said that he was “on the fence” about allegations levelled at Dustin Hoffman. Last year, actress Anna Graham Hunter alleged Hoffman groped her and made inappropriate comments when she was a 17-year-old intern on the set of the 1985 TV movie Death Of A Salesman. Playwright Cori Thomas accused him of exposing himself to her in New York in 1980, when she was 16. In response to Hunter’s allegations, Hoffman issued a statement saying the incident “is not reflective of who I am”. Neeson said of the #MeToo movement: “It’s healthy and it’s across every industry. The focus seems to be on Hollywood at the minute, but it's across every industry."